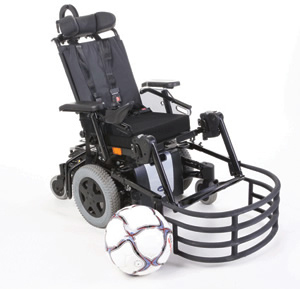 The TDX SP Special is a high performance power chair specifically designed for playing football. The TDX SP Special is a Mid Wheel Drive which has a great turning circle for outstanding manoeuvrability. If you have any questions regarding the TDX SP Special or would like to book an appointment to be assessed please do not hesitate to contact us on 0330 0581 008 (Local call rates apply) or FREE PHONE 0800 626 829 or complete the form on this page and we will get back to you.